A moment later, they were moving, the girl and the dog turning their heads to look out the windshield, the side and back windows. On guard against the world. A wolfish gray dog stared at him, its tail witching with an almost wag. The dog had a wire-basket muzzle over its mouth and a medical patch over one eye. It as sitting on the floor outside a large steel-barrel kennel, a restraining safety chain around its neck. The kennel door was wide open, as though the animal had somehow let itself out. Uncaged is a real thrill ride of a book. Once you start reading you'll find yourself immediately and completely immersed in the plot and unable to put the book down. It's not a short story, it's more than 400 pages long, but thanks to Sandford and Cook's captivating writing style, you'll be flipping through those 400 pages at a break-neck, finger-blistering pace. It's really a well-written, refreshingly bold, often times deeply disturbing, thought-provoking and intensely gripping novel, and I highly recommend picking it up. Thanks to the intelligent plot line filled with relevant themes such as experimentation on animals, eco-activism, corruption and the never ending David-and-Goliath sort of battle against multi-million dollar corporations, this book reads more like an adult novel that your usual YA. I was completely unprepared for how much the descriptions of the experiments performed on animals would affect me. Not only was I emotionally invested in the story, I often felt physically ill, reading about the horrible abuse and cruelty. The way the story plays out leaves you satisfied, wanting more, but also feeling kind of dirty and in a need of a long, hot shower. 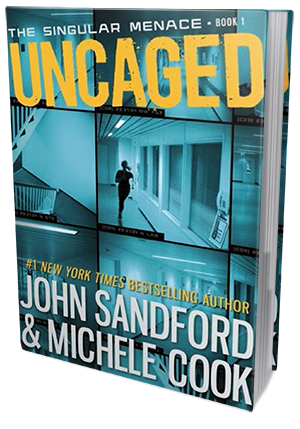 John Sandford is a well known bestselling author of numerous thrillers, and his skill in writing those is evident all throughout Uncaged. Together with Michele Cook, they have penned a really good, blood-pressure-spiking story. Being an animal lover through and through, I was especially affected by the subject matter and found myself completely engrossed in the plot line right from the very beginning. This book has a strong cast of unique characters - characters that are not your usual cookie cut-outs YA heroes and heroines. They are more diverse, more convincing, more real than most of the YA characters out there. Odin is a computer whiz, a skilled hacker and an autistic animal-lover with a golden heart. He's a great character and I enjoyed the parts of the book revolving around him and his actions. Shay, his younger sister, is fierce, unstoppable, very brave and protective of her older brother. I really liked her, too. Their story was a heart-pounding and thrilling, but also quite moving, considering the lengths they'd go to help each other. Overall, this was an awesome beginning to what promises to be the next hit YA-series, and I am definitely going to be reading the next books. In fact, I really can't wait for the next one to come out.